Later, at the scene of the blaze, Edison was quoted in The New York Times as saying, “Although I am over 67 years old, I’ll start all over again tomorrow.” He told the reporter that he was exhausted from remaining at the scene until the chaos was under control, but he stuck to his word and immediately began rebuilding the next morning without firing any of his employees. Was there any other viable response? In new book, “The Obstacle Is the Way: The Timeless Art of Turning Trials into Triumph,” author Ryan Holiday says there wasn’t. 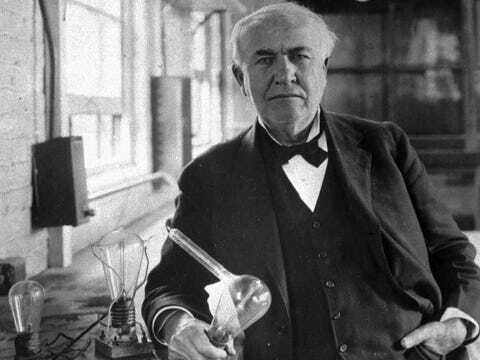 Sure, Edison could have wept, yelled in anger, or locked himself in his house in a state of depression. But instead, he put on a smile and told his son to enjoy the spectacle. After thoroughly surveying the damage, Edison determined that he’d lost $919,788 (about $23 million in today’s dollars), according to Matthew Josephson’s biography. The flames had consumed years of priceless records and prototypes, and his plant’s insurance covered only about a third of the total damage. Edison’s story is a powerful example of Stoicism, the ancient Greek philosophy that Holiday explores in his book. Holiday explains that the Stoics were not emotionless men devoid of feelings, but rather men who practiced total control over their emotions in a way that acknowledged forces beyond their control. It’s fine to initially respond to loss or failure with sadness or anger, says Holiday, but only if it’s fleeting. When tragedy strikes, you must accept that it has happened and that you cannot change the past. Finding the opportunity to overcome a challenge ultimately makes you stronger.